A win on Saturday would give the 36-year-old American Serena Williams a seventh US Open title, breaking a tie with Chris Evert for the most in the Open era. 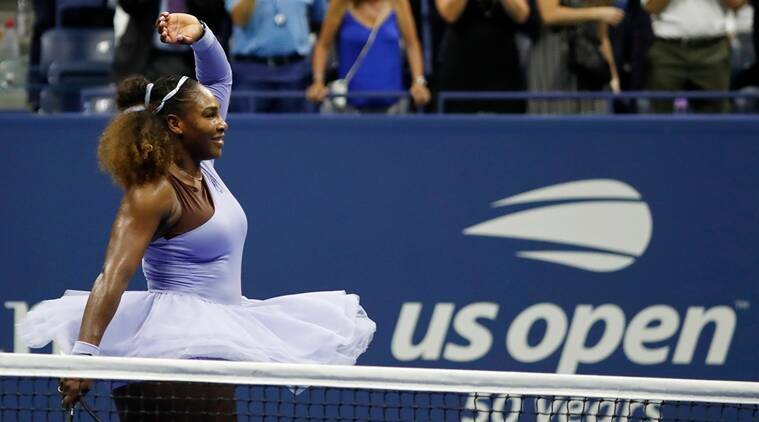 Serena Williams swept past Anastasija Sevastova 6-3 6-0 on Thursday and into the final of the US Open to sit one win away from a record-equalling 24th Grand Slam title to continue her remarkable return to the top levels of the game after she almost died while having a baby last year. Williams walked off Arthur Ashe Stadium court with a wave and twirl to await the winner of the other semi-final between Japan’s Naomi Osaka and American Madison Keys, who lost last year’s final to Sloane Stephens. It will be the second consecutive Grand Slam final for Williams who came agonisingly close to matching Margaret Court’s record of 24 majors at Wimbledon but was beaten by Angelique Kerber. Sevastova arrived at her first Grand Slam semi-final riding a wave of momentum built from a fourth round win over seventh seed Elina Svitolina and a quarter-final demolition of defending champion and third seed Sloane Stephens. That confidence jumped when the 29-year-old broke Williams to open the match then held for a 2-0 lead as an uneasy hush fell over the Arthur Ashe showcourt. But Williams, who had dropped just one set on way to the last four, quickly restored order as she charged the net one moment and pounded winners from the baseline the next that left her opponent stunned as the American won 12 of the next 13 games. “I know how to volley, I usually come in just to shake hands,” said Williams. The 19th seed Latvian may be disappointed with the outcome, Sevastovoa said she left her first Grand Slam semi-final with a sense of accomplishment. Asked what positives she was talking away from Flushing Meadows, Sevastova said it was the realisation that she could “play with the best players in the world”. “I beat two top-10 players. I was playing (an) okay match today, maybe not my best tennis,” Sevastova told reporters after the match. “Yeah, just knowing that I can be there, that I’m first time semi-finals. Sevastova’s performance at this year’s tournament, during which she dispatched 2017 champion Sloane Stephens in the quarter-finals, marked the culmination of a long road back. With persistent injuries plaguing her early years as a professional, she decided to retire in 2013. But Sevastova came storming back to the sport in 2015 and clinched a US Open quarter-final berth in 2016, her first appearance in the last eight at a Grand Slam. She repeated the feat last year. Reflecting on Thursday’s match, Sevastova said Williams was simply too tough to beat.